Problems with your engine or transmission are quick to make themselves known and devastating when left unchecked. The moment there is trouble under the hood or stemming from your gearbox, call Perrysburg Auto Mall for comprehensive service. We are the foremost authority on transmission and engine repair in Northwest Ohio. 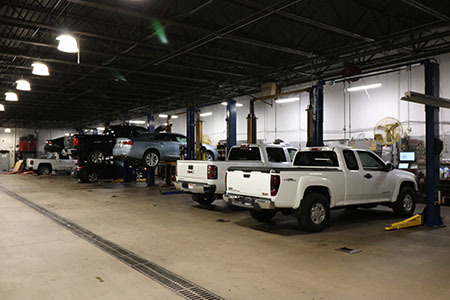 When you are looking for expert transmission and auto repair services, look no further than Perrysburg Auto Mall. Our highly experienced technicians will provide you with complete and thorough vehicle diagnostics, and we offer a full range of top quality repair services. Our services are backed by our great warranty program, so you will have peace of mind when you bring your vehicle to us. If you operate a fleet of company vehicles, our local and national programs can provide you with expert maintenance and service. We specialize in transmission repair and replacement, with multiple Automotive Service Excellence and factory trained Master transmission technicians. We are more than qualified to repair or replace your vehicle’s transmission. We also offer financing options for these larger repairs. We are competitively priced and offer free loaner vehicles for large repairs. An under-maintained engine can break down entirely. When this happens, you will need an expert professional to dismantle, fix and rebuild it. Trust this critical job to our team and we promise your vehicle will be running smoothly again in no time at all. Catastrophic transmission damage needs to be completely remediated. We will disassemble your transmission, provide viable repairs and rebuild it to spec, saving you money on a complete replacement. Not every shop in Northwest Ohio is equipped for this level of transmission repair. If your car is in good condition but your engine is beyond saving, look to Perrysburg Auto Mall for an engine replacement. We will removed the damaged engine and retrofit the new one to get you back on the road. It will be like having a brand-new vehicle! When transmission repairs just will not cut it, we provide transmission replacements. For the cost of a new transmission, you could save yourself from paying years of new car payments. We provide upfront and honest quotes, as well as workmanship you can rely on. Engine tune-ups and routine transmission flushes are a great way to keep these vital systems in proper working condition. Turn to our certified team for everything you need, at regular intervals. We are committed to servicing your vehicle to its fullest.